You can talk to a trained volunteer in person at our branch. Opening times below. We support HMP Norwich and HMP Bure by training prisoners to deliver face-to-face emotional support to their peers. Talk to us any time of the day or night, via phone, email, SMS or in person. We regularly visit Norwich schools to give talks and attend wellbeing events. We are also able to offer postvention support. Please email [email protected] for more details. Norwich Samaritans have been supporting Norwich and Central Norfolk for 55 years. Every year, our 160 volunteers give over 20,000 hours to support those struggling to cope. What's going on in Norwich? As well as delivering our listening service, we support HMP Norwich and HMP Bure by training prisoners to provide emotional support to their peers. Our Outreach team regularly deliver talks and/or training at schools, local employers and community groups. We also have two charity shops that help us to raise funds and awareness of our service in the local community. And of course, we host the occasional fundraiser. Our next Information Day will be at our branch at 10am on Saturday 13th April 2019. Norwich Samaritans is a registered charity (1168681). 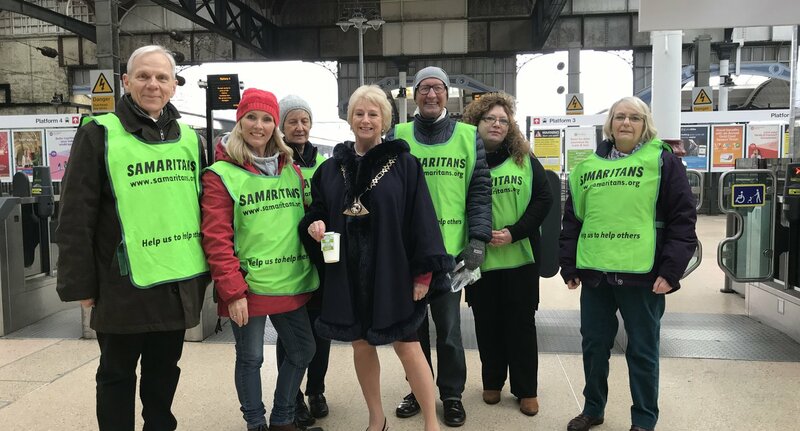 Norwich Samaritans is a recognised branch of Samaritans.